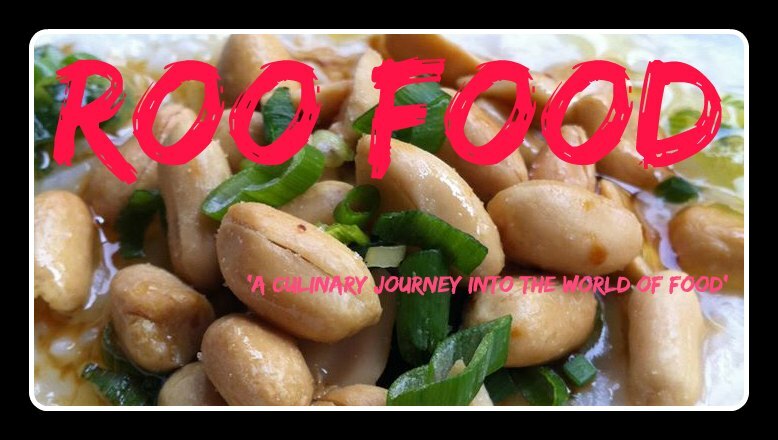 Roo Food: It's a Goa ! 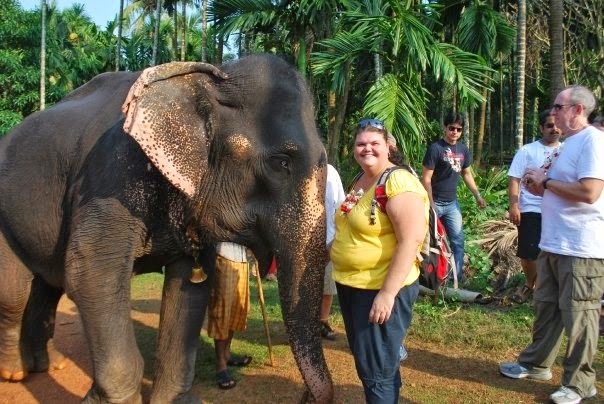 Whilst living in Dubai (back in 2009), after a crazy, stress filled, horrible day I booked a few days away to Goa. Why not? This little getaway was no budget holiday. I had booked into the 5 * TajExotica and I knew I was in for a treat. 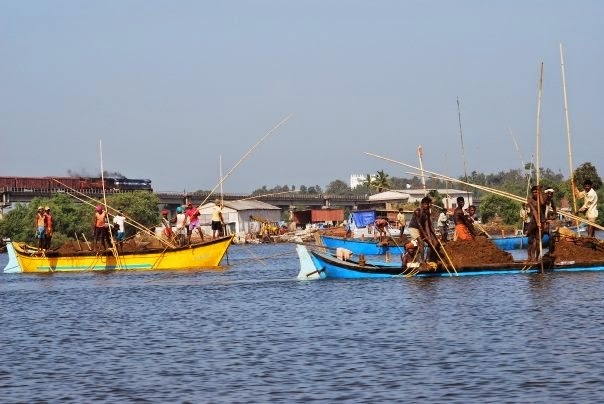 I arrived into Goa at 4am and was meet by a transfer, which whizzed through the narrow lanes of Goa at an alarming speeding, dodging late night traffic and cows lazing on the road! I was certain that one of the sacred cows wouldn't make it to morning.....I am staying just outside of Candolim, next door to Fort Aguada (which is another Taj Hotel built into the Fort). 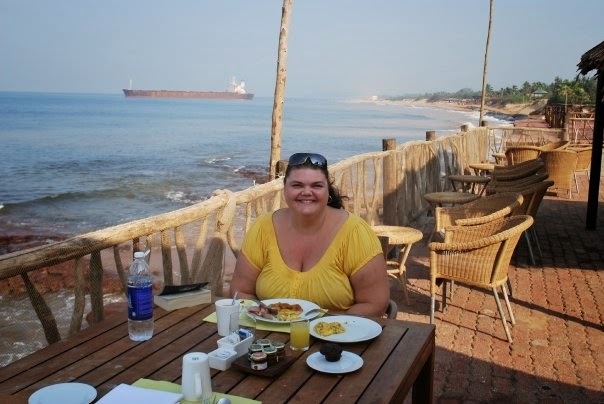 Up far to early after a 4am arrival, a buffet breakfast in the open air overlooking the Arabian sea made up for it...although I can't tell you what I had...from memory (and it's a long way back) there were eggs, dosai and dhal, along with western breakfast staples. 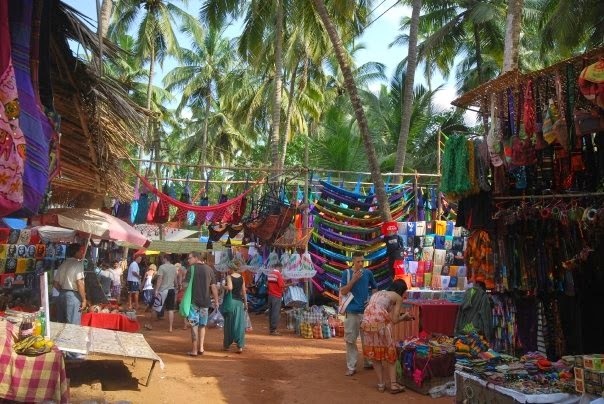 Next I was haggling for a taxi to take me over to Anjuna Markets (only held on a Wednesday)....a hippie style markets that began way back when the hippies were flogging their wares to make some money for another week in Goa, or to move on to somewhere new. The market is awash with colourful fabrics, flashy jewellery, locals trying to grab your attention to come to their stall and further into the markets you happened upon westerners who are hanging out in Goa (or living there for so many months of the year) selling some funky jewellery or clothes. There were drumming stalls, hammocks and colourful fabric lanterns, Nepalese and Tibetan handicrafts, plenty of sarong and pashmina stalls, leather goods, silver jewellery, nik naks and junk! Local men dressed in traditional garb wandering around playing a trumpet with a cow all dressed up in colourful materials and bells.. It was getting far to hot and crowded so headed back towards Candolim for a late lunch and a few cold beers. I find a little restaurant that was serving freshly grilled promfret recheado. Recheado comes from the Portuguese cuisine and is a blend of Indian spices vinegar and is stuffed inside and also covers the fish. It's delicious. The pomfret is flaky and moist and soft. I didn't need the chips. The hotel is a haven of tranquillity and lush gardens. 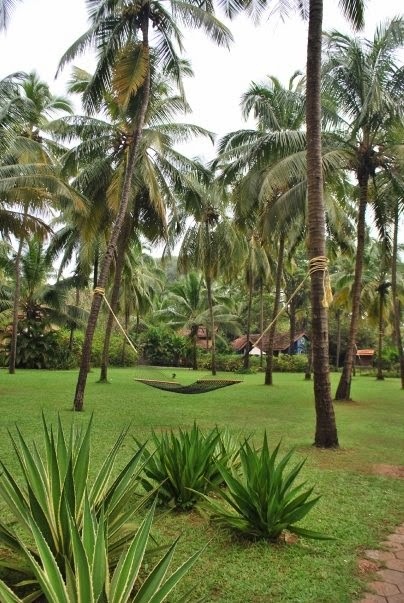 It's very quiet and great to kick back after a day of hustle and bustle of Goa and I spend the rest of the day in this. I stayed in for dinner at the Taj Exotica at their open air restaurant, replete with a full moon and mosquitos. thankfully I had a mosquito coil under the table at my ankles. 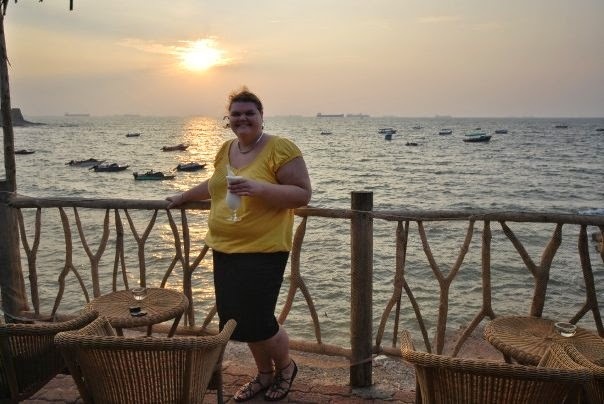 Sunset cocktails overlooking the Arabian sea was the way to start the evening. Goa is famous for their fresh seafood and I took full advantage of this during my visit. I start with tandoor prawns with oregano seeds. The plump, tender prawns are full of sea flavour and the pop of the oregano seeds adds a texture and a strong oregano taste as they pop in your mouth. For main I couldn't pass up on the rock lobster. Steamed and served whole...it's the best way to enjoy shellfish. The meat is sweet and tender and super delicious. The following day I had booked a private driver for a full day of sightseeing. I met my man Vinay at the gate of the hotel and headed 2.5 hours to the National Park border to meet up with a 4WD to head up into the National Park and the Dudhsagar Falls, which is on the Eastern border with Karnataka. I purchased some fruit to take to the monkeys, but didn't know once we got to the entrance of the park that we were not allowed to take it in...so into the bag it went until I got to the falls. 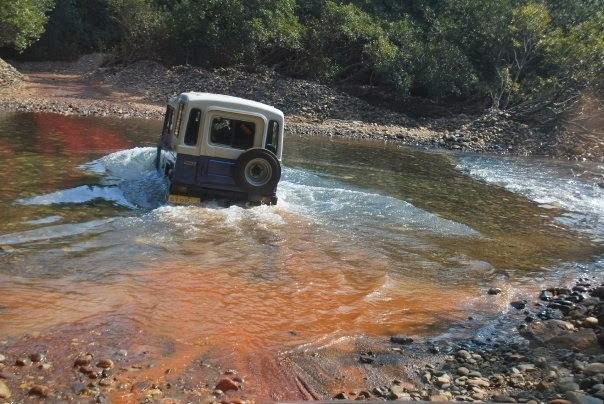 We had to ford 3 small rivers/creeks, making sure we held up our bags as the water poured into the floor of the truck! Definitely a bumpy but fun ride. Hiked into the falls, which appeared very popular but the water was absolutely icy cold! 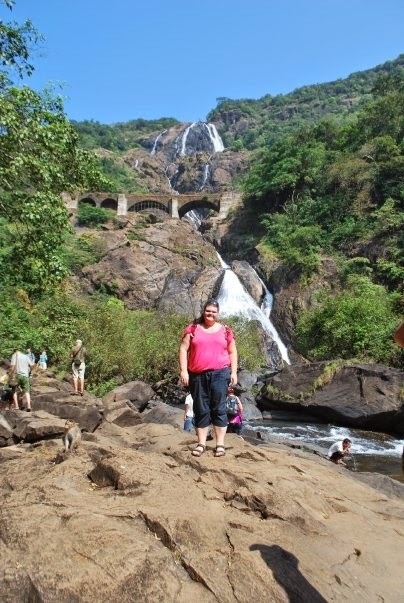 The falls are 603 metres high and the best time to see them are in the monsoon season (but inaccessible) or just after the monsoon season when there is more water! Remember that fruit I purchased?....well I did feed it to the monkeys. Hundreds of white face monkeys. So adorable and although wild, clearly happy to interact with humans. 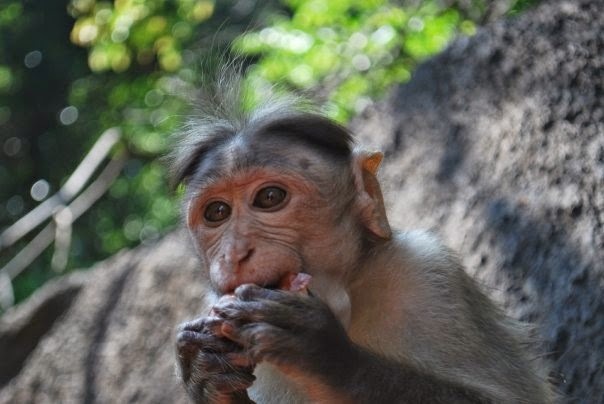 One of the baby monkeys took the fruit from me, not taking his eyes of me and then swiped my hand away. So cute. They were adorable and they just amble around the group....they loved peanuts too and at one point one of the monkeys grabbed a bag of nuts off a tourist and gobbled the whole thing down! I waded into the water and started scrubbing him down. He was just kneeling in the water and lapping it up. It was hot, so this was a pampering session for him! 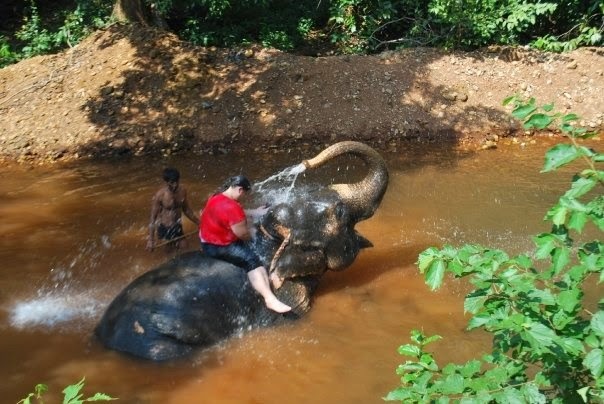 Next I then climbed onto the elephant (no mean feat as I was worried I would hurt him) but he was all ok with it. 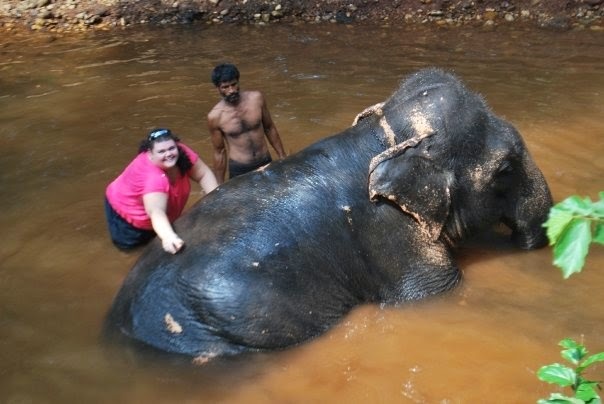 Once I was straddling him around his neck, he then gave me a shower. Blowing water all over me from his trunk over his back. It was awesome....definitely a highlight of the day. Elephants are beautiful and graceful beasts. Next stop was a spice plantation. A lush forest of spice trees and coconuts. On arrival I was served lunch of Goan foods using the spices found on the plantation but firstly the most important thing to have is a glass of Cashew Feni...the local firewater I reckon...at 50% it definitely has a kick!.. There was a buffet lunch included at the plantation, however I wasn't feeling hungry (*gasp* I'm sure it was the heat and dehydration)...so I just zoned in on a Goan speciality. Chicken Xacuti with some steamed rice. The curry is made with shaved coconut, white poppy seeds and chillis. It was very tasty served with a coconut chutney and poppadoms...it's all I could manage. The tour itself was informative as we wandered around through the tourist area of the plantation. The plantation itself is just a jungle where all the spices and trees grow amongst each other, with no specific areas for each spice...no paths. The pickers just amble through the jungle finding what they can....however, for the tourists they have set up a small area with paths for them to access the spices. Cashews are another product that is famous in the region and loaded down with a kilo of fresh raw cashews I left the plantation behind. By the time I reached the hotel mid afternoon I was starting to feel a little hungry and definitely thirsty. So I headed to a local 'restaurant' for this tasty dish. Called prawn papad...its literally a spicy prawn paste wrapped in papad (which is an Indian flatbread). Commonly deepfried as I had it, although you can have it roasted or grilled. After a day out in the sun I decided to stay in and enjoy another night at the hotel. I headed to the Beach House for a more fine dining experience. Ironically, the wine menu is lengthy with good international wines, however the only one 'available' this night was an Indian wine. Let's just say it was one of the worst wines I've tasted and has become that memorable because of it! The menu on the other hand is favourable with many local dishes (jazzed up) and finding it hard to choose. In the end I choose the crab recheado and the prawns in saffron served with garlic naan. The recheado paste is mixed with the crab and then stuffed into crab shells. The aroma is thick with Indian spices and the taste buds are having a little party. The prawns in saffron are a surprise. They are creamy and intense curry flavours, however it works with the plump fresh salty prawns. Who can pass up a fresh bowl of garlic naan. Crispy and fluffy, like a naan should be and laced with roasted garlic they are perfect to dip into the sauce. Another wonderful day in Goa. Boating through the mangroves was peaceful even though we were on the hunt to spot the sea water crocodiles (apparently they only eat fish!). 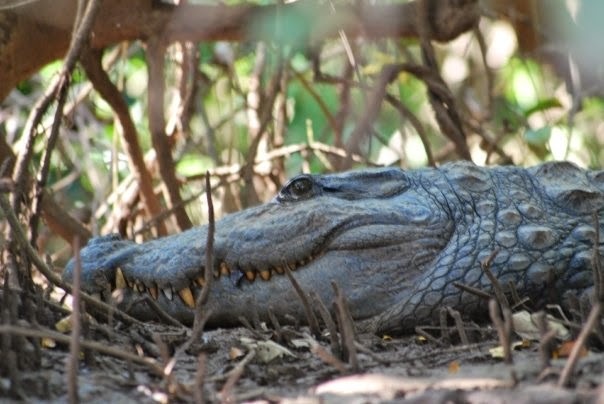 The crocodiles are protected and some grow to over 3.5/4 metres long....and apparently have never killed anyone. A morning of peaceful river cruising and a couple of hours in the old town we headed back to Candolim, where I asked Vinay (my driver) out for lunch...the least I could do after two days of adventure....but on one condition, he took me to a good local goan restaurant...proper Goan food, none of this touristy tamed down food.... and it was great. We ate red snapper in a rich sticky masala sauce, kingfish fillets fried in breadcrumbs which was delicious and a fish curry sauce (for my papads (or poppadums) as I couldn't eat the rice). It was a dusty little restaurant overlooking the narrow road leading out of Candolim (far from the tourist trail) and I loved it....It was a Goan feast of fish curry, red snapper masala, kingfish fillets, dahl, rice and papadoms...washed down with Kingfisher beer. I spent a lazy afternoon by the pool relaxing before venturing down the road for some dinner at a great little restaurant set in the terrace gardens of the house...It's called the Stone House and it was a lush little haven! They also had a singer taking requests for the diners....the mozzies were out in full force, but a mozzie coil did a good job when placed at my feet under the table! Getting my last dose of good (cheap) seafood I had the special kingfish and vegetable kebabs and a Goan vegetble curry. Lastly, a night at the markets of some last minute shopping and enjoyment of Goa. 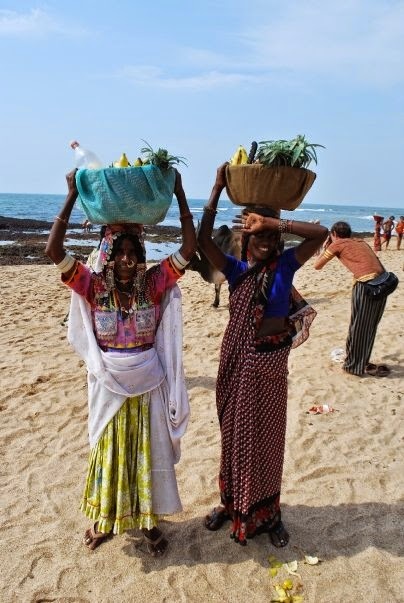 I met this lovely Karnataka lady selling her wares. I just love the jewelry and dress of the local woman. So colourful and vibrant! 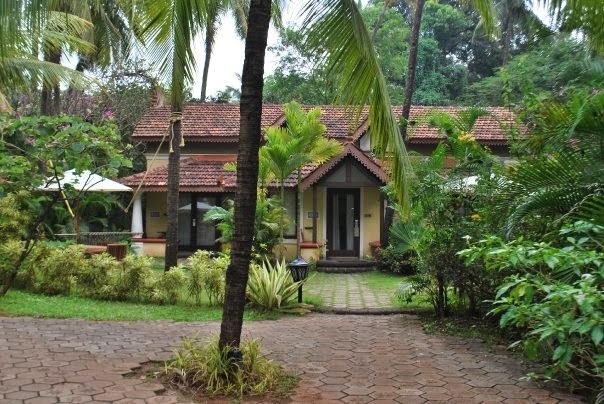 Goa offered such a great amount of culture, delicious food, friendly people and a wonderful place for a respite. Would love to visit Goa one day! Happy New Year to you. Here's to an even more delicious 2015!